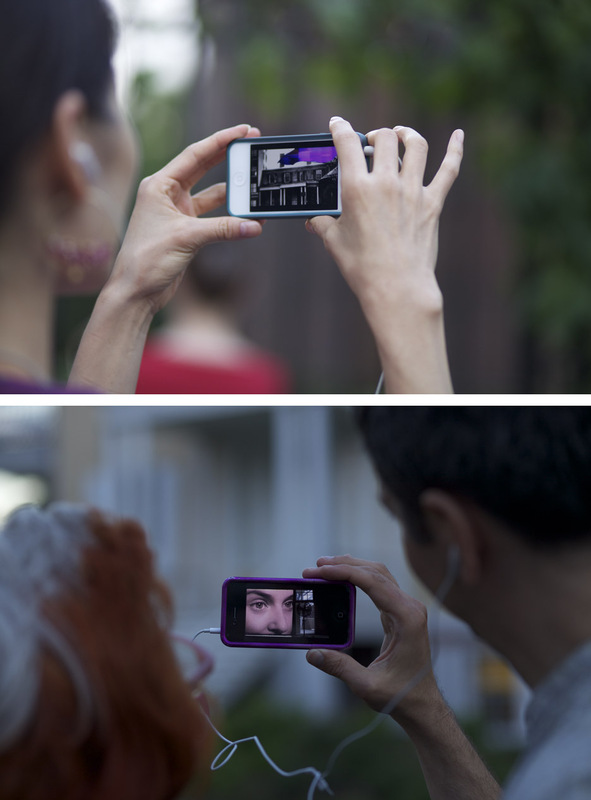 iParade is a series of locative media-works, created by LoVid as smart-phone Apps. iParade uses GPS data and includes video, sound, and texts that are accessible only in specific geographic locations. The content is inspired by, and recorded in the same locations, such as a street, a building, or a city park. To watch the work in full, visitors need to physically relocate themselves to access uploaded segments that are linked to each particular location. iParade renews viewers’ appreciation of their physical environment by providing a unique perspective into narratives and abstractions of public spaces. In iParade#3: Disintegrative Fabrication, LoVid explores the urban setting, history and energy of Troy, New York.The artists interpret and investigate the ways in which the city and its culture have evolved and transformed from the industrial era to the post-industrial and current technological era; they speculate on the relationship between biology and technology. The collar industry was chosen as a clear example of the history of a profession, dominated by female workers in the 1950s, that combined handmade production and technological developments for DIY culture, including innovative tools and systems. The piece takes place in historic downtown Troy, NY. The public premier of Disintegrative Fabrication was hosted as part of the Hyperplace: Troy festival which took place on September 25 and 26, 2015. In iParade#2: Unchanged When Exhumed, LoVid explores relationships between human memory and physical places, as well as displaced memories and technology. This work is inspired by the historic relocations of Hamilton Grange. Additional inspiration comes from an archive of student films from the 1940s and 1950s. These films were produced as part of the Film Institute at NY City College under the direction of the artist and filmmaker Hans Richter. The piece takes place in Hamilton Heights, a neighborhood in West Harlem, New York, NY. iParade#2: Unchanged When Exhumed was made possible with support from DiAP NY City College, Experimental TV Center Finishing Funds program which is supported by the Electronic Media and Film Program at the New York State Council on the Arts, Rhizome Commission, and Franklin Furnace Fund supported by Jerome Foundation; the Lambent Foundation Fund of Tides Foundation, and by public funds from the New York City Department of Cultural Affairs in partnership with the City Council. 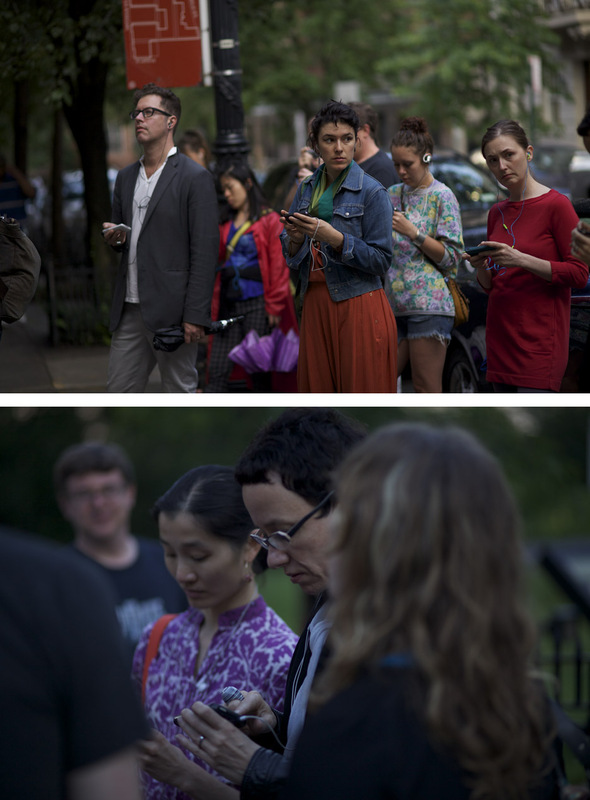 The public premier of Unchanged When Exhumed was hosted by Elastic City on June 7 and June 9, 2012.
iParade#1: Rocks That Look Like Rows Of Trees, focused on observing the mundane and drawing meaning from small interactions and discoveries. Rocks That Look Like Rows Of Trees was created and is located in various places on Weehawken Street, a quiet street in the West Village, with nearly forgotten history. The text and video in the work evoke a haunting and mysterious feeling. They also reflect on our process of interaction and intimate relationship with technological objects. iParade#1: Rocks That Look Like Rows of Trees was produced with the support of LMCC’s Manhattan Community Arts Fund. This project was created using ARIS.